Old houses are filled with treasure. Sometimes, that treasure takes the form of old letters, photographs, newspapers, and other odds and ends that attest to the human presence that once filled a home. 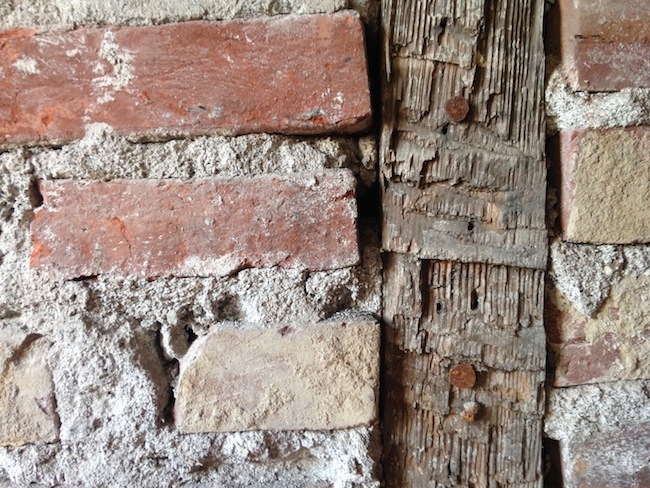 In the salvage world, the bounty is in the building materials themselves, the wood, brick, and stone that spent generations as parts of a house. Occasionally, the treasure occupies both categories, and that is what we are concerned with here today. Behold the scrawled name of Heise & Bruns, a lumber company that operated in our fair city from the 1860s to the 1920s, and the stamp of William Applegarth & Son, a shipping and commission house incorporated in 1850. First, let’s examine Heise & Bruns. The firm was started by German immigrants William Heise and John Bruns in 1862. Their offices and yard were at the intersection of Concord and Eastern Avenues (currently the site of the Institute of Marine and Environmental Technolody, in Harbor East). 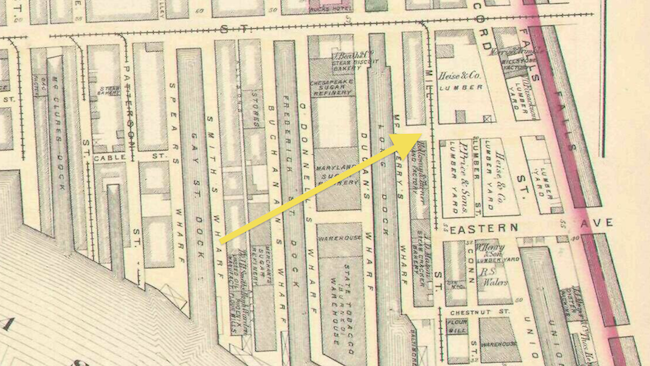 The yard was the largest in Baltimore, occupying 30,000 square feet, with room for one million boardfeet of lumber. 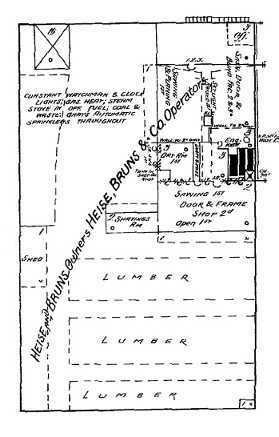 As you can see in the schematic below, from old Sanborn insurance maps, at Heise & Bruns, they did it all: in addition to fulfilling the raw lumber needs of a growing city, the firm produced doors, windows, trim, lath and shingles. William Applegarth & Son made their money operating ships up and down the Atlantic Coast. William was from a prominent Maryland family; he quickly moved from captaining ships to owning them, and eventually he became a master broker, overseeing a sizable fleet. In 1860, the value of William Applegarth’s real estate was listed as $13,000, while his personal wealth was estimated at $10,000. In addition to ferrying loads of salt from the Caribbean and granite from Port Deposit, the Applegarth concern sent schooners up the Susquehanna towards the rapidly denuding pine forests of Pennsylvania. 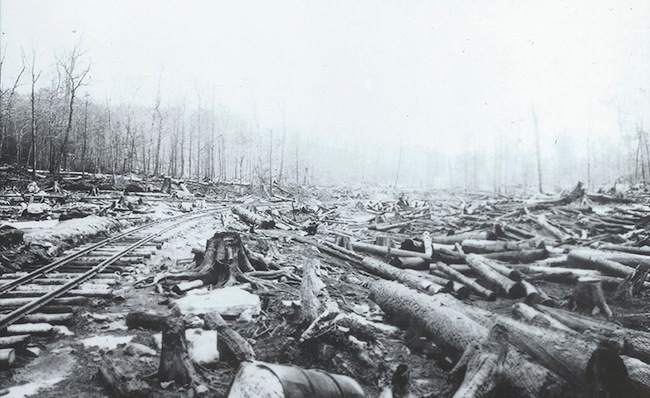 The image below, from the Pennsylvania Lumber Museum, shows how the tall stands of Eastern White Pines that flourished in much of the state were clearcut, yielding boatloads (literally) of valuable lumber that made its way to cities across the Midwest and East Coast. William died in 1873, but his sons Nathaniel and Thomas operated the company long after his passing out of their offices at 507 E Pratt, just down the street from the Heise & Bruns lumberyard. 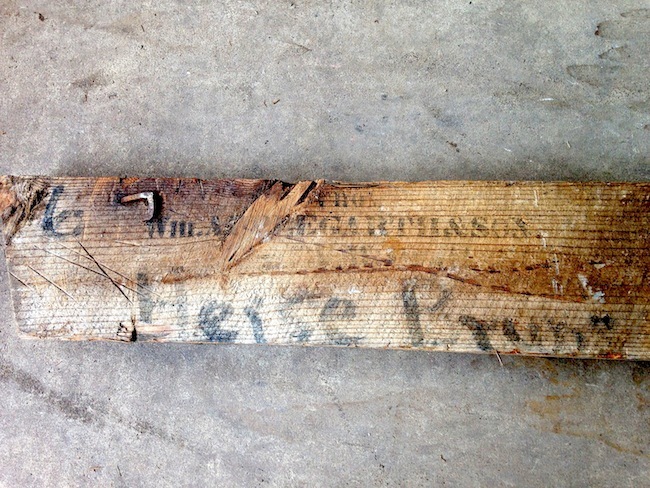 It seems likely that our joist was stamped by the Applegarths as cargo, then painted with the Heise & Bruns name once it had been taken into inventory, or perhaps once it was being ready to be sent to a builder. 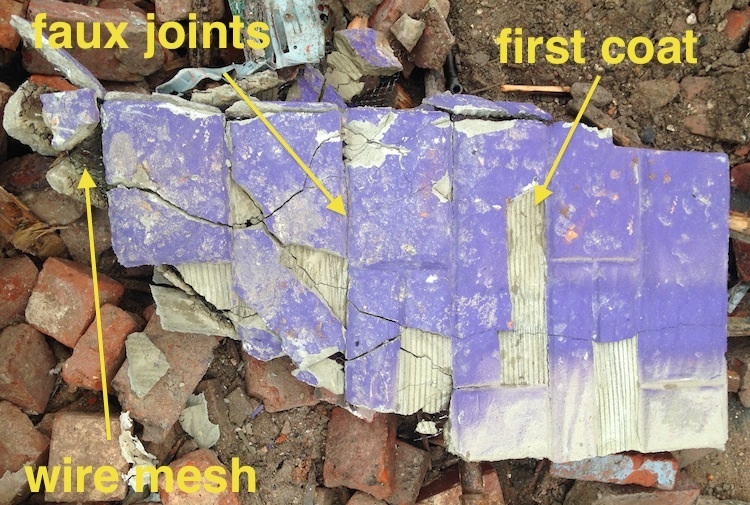 After the joist had been set in its pocket, it would have had lath and plaster applied to its bottom and floorboards nailed into its top; strip by strip, board by board, the names on the joist would have been obscured as the piece of wood completed the journey from raw material, to usable lumber, to an invisible structural member of a Baltimore rowhouse. We resisted calling this post Wane’s World, so we’re already off to a good start. What is wane? Or, more specifically, what is wane as it relates to wood? The word itself is familiar enough, as in “waning strength” or “wax and wane.” The etymology is worth exploring- “wane” comes from the Old English “wana” meaning shortage or defect, which in turn comes from the Germanic “wano” which roughly translates to insanity. In the wood world, wane is a rounded corner on a piece of milled lumber caused by the natural contour of a tree. 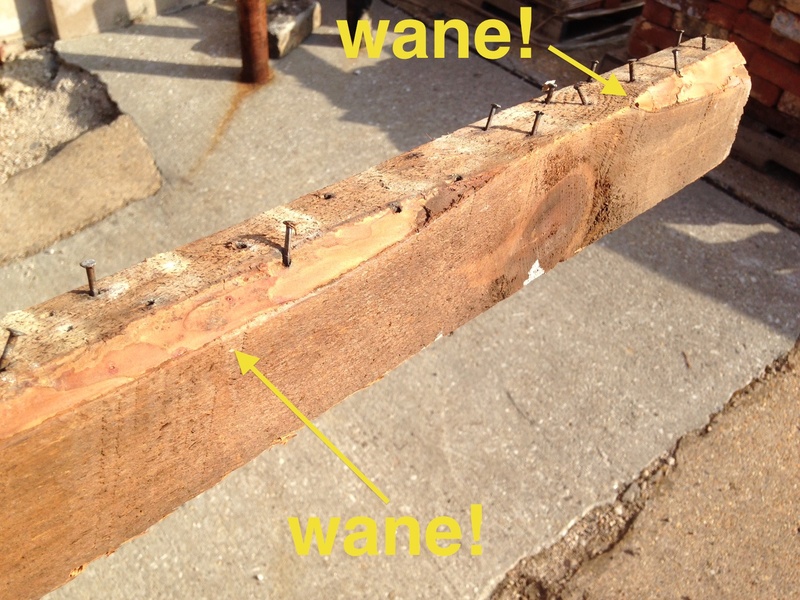 In other words, wane is what happens when a tree isn’t quite big enough to yield that last piece of square lumber. Wane doesn’t necessarily weaken a piece of wood, but it does decrease the surface area for fastening floorboards and lath. This stud features a couple waney patches. This is as the result of the knot you see towards the bottom of the piece, which would have grown into a branch, thus creating a bulge in the tree. We come across quite a bit of wane. 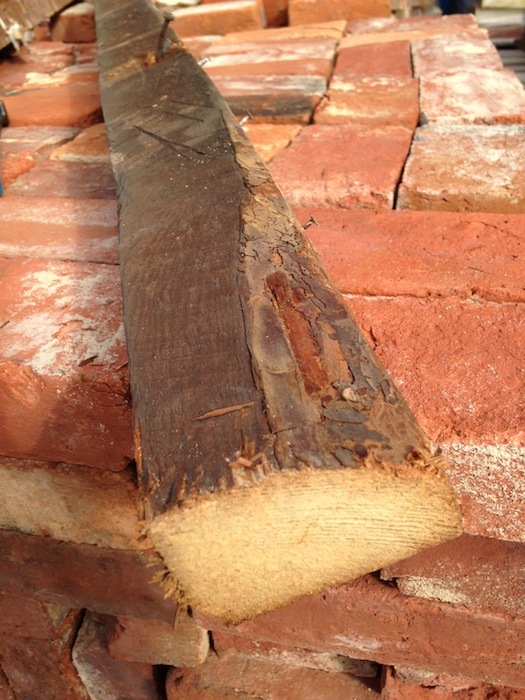 In some cases, traces of bark help us identify the species of tree which gave its life to become a stud or joist. 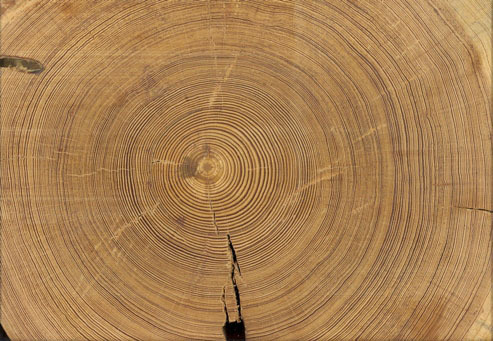 From looking at the inner bark on this patch of wane, we can tell that this stud came from a loblolly pine tree. In the woodworking world, there’s a strong demand for live-edge furniture, that is, furniture that features the outermost part of the tree, bark and all. This furniture is usually made from slabs from felled trees, but maybe a “wane-edge” cottage industry will crop up, too. We like to talk building materials here at BBBB, and we’ve regaled you with tales of joists and studs, bricks and belt courses, struts and cut nails. But we’ve yet to discuss one of the most iconic building materials Baltimore has ever known, the material John Waters called the “polyester of brick”: Formstone. Formstone has achieved Kleenex-like name recognition, but the word is merely one brand name among a host of other stucco products such as Rostone, Perma-Stone, Fieldstone, and Tru-Stone. The product was applied to building facades thusly: wire mesh was fastened to the facade of a building with small nails inserted into mortar joints. Successive coats of plaster were then applied until a desired thickness was reached. Formstone installers then got to work creating the distinctive stone-like appearance with molds, rollers (for texture) and implements for scoring the stucco to create faux mortar lines. The stuccoed facade was then often colored to suggest a wall made from several types of stone. Formstone (and similar products) can be found in cities up and down the East Coast, but it feels particularly Baltimorey. Some folks estimate that over 50% of the houses in the city are Formstoned. On Eager Street, 27 of the 35 houses had Formstone on them. In the next chapter, we’ll explore why only 1/5 of Eager Streeters went without Formstone, and why they may have been the sensible ones! 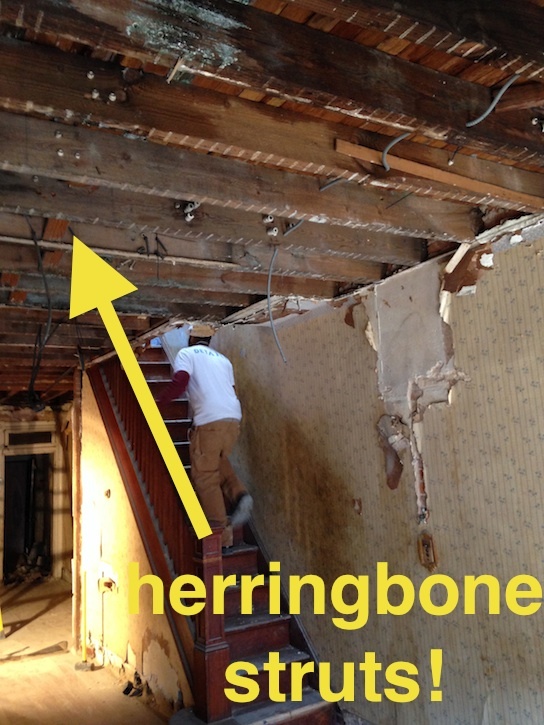 Herringbone struts are diagonal members, generally placed in an “X” configuration, that are fastened between joists. 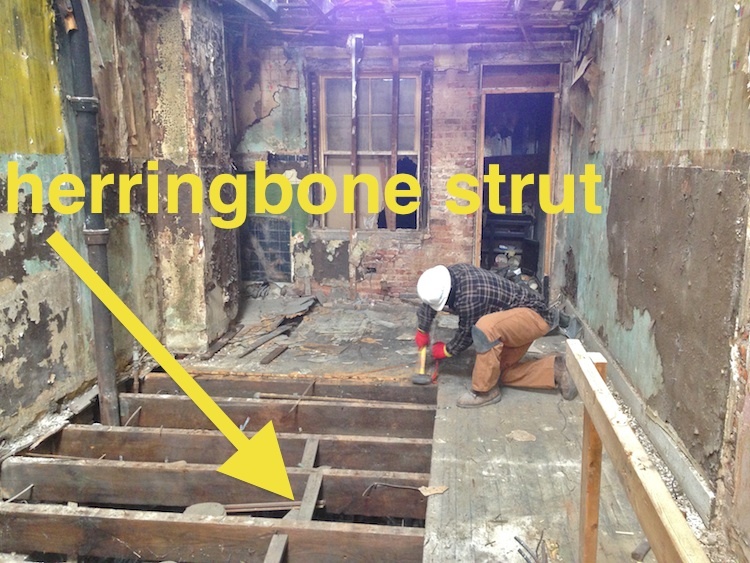 By tying one joist to its neighbor, herringbone struts firm up flooring systems. As Burrell alluded to, they also prevent joists from warping or twisting over time. 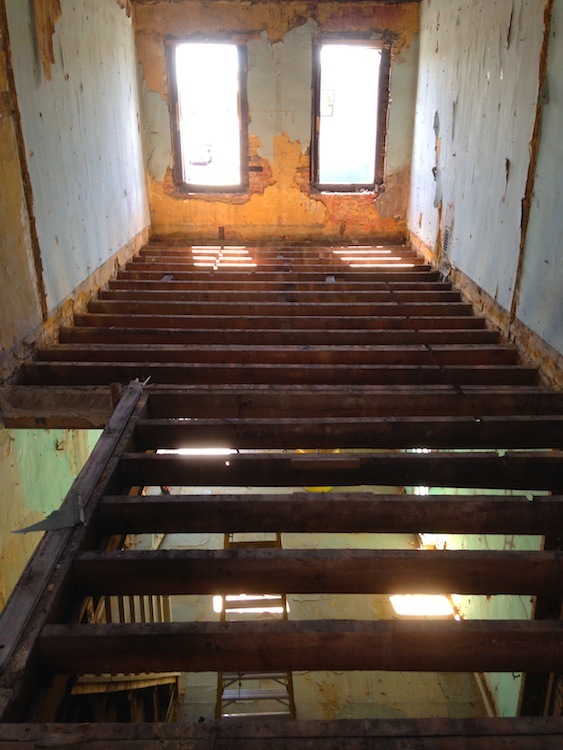 The joists in the houses on Eager Street stretch 12 feet from pocket to pocket. While this span pales in comparison to some of 16′ wide houses we see in the West side of town, builders nonetheless thought it prudent to include blocking between the joists. Herringbone struts also made it easier to run pipes and lines because they could be run along the joists without having to drill through solid blocking. In the days of knob and tube electrical wiring, when joists were riddled with holes for wiring, herringbone struts made a lot of sense. Herringbone struts required an extra degree of craftsmanship, as well. To fix the struts snugly, a beveled cut had to be made on each side of the piece- without the use of a fancy whiz-bang $600 compound miter saw, this was no small task. 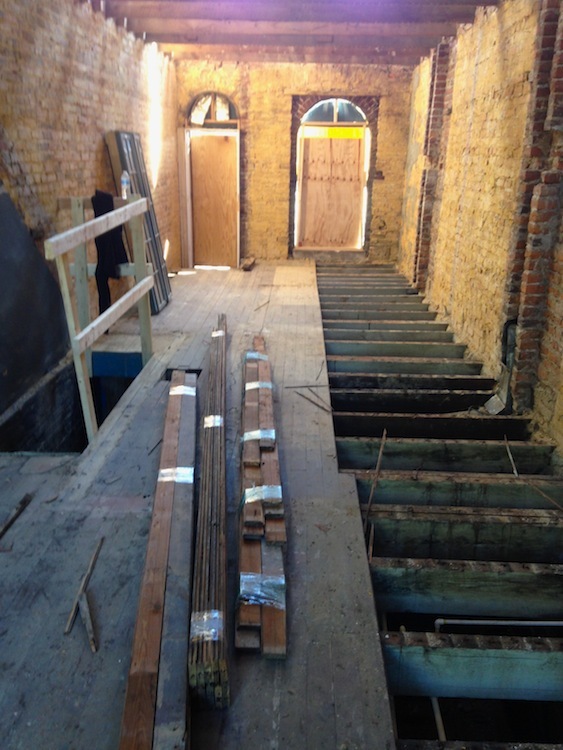 We’re glad Frank Novak’s crew made the effort, because 107 years after they were laid, our joists are straight as can be without a twist or warp in sight. 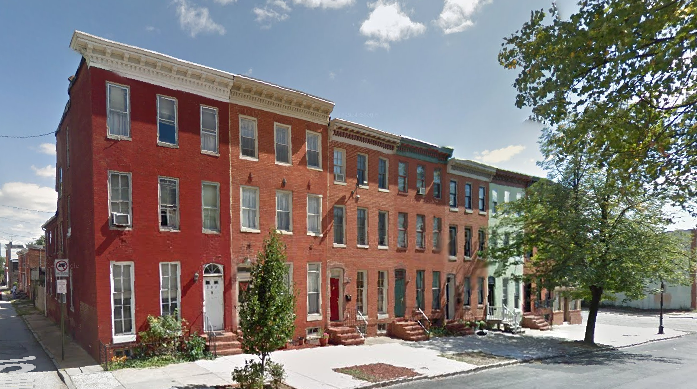 What’d it cost to build rowhouses similar to the ones we’re deconstructing on Eager Street? 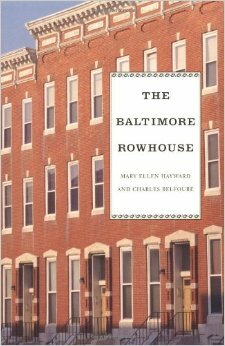 To answer this question, and just about any other question having to do with rowhouses, we turn to Charles Belfoure and Mary Ellen Hayward’s The Baltimore Rowhouse, the absolutely essential reference for all things rowhousey. When construction began, basements had to be dug. Laborers were paid $1.25 per day, and a team of nine fellows could do the job in two days. On Eager Street, the next step would have been to lay the brick foundations. Bricklayers were typically paid 60 cents per hour, tying them with plasterers as the top earners among the tradesmen. 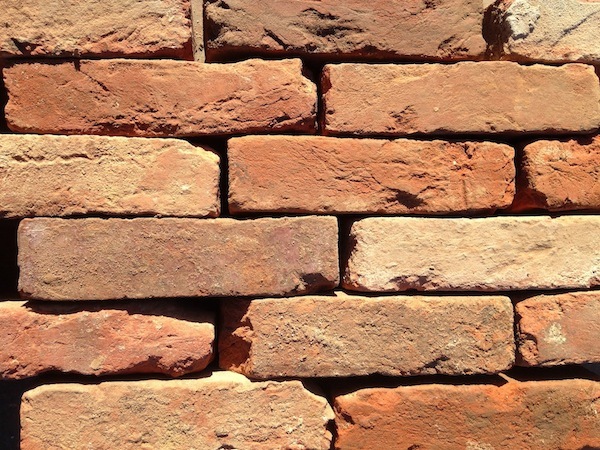 After basements were hand dug, bricklayers laid a foundation of extra-hard bricks fired at high temperatures. They were typically paid 60 cents per hour for their work. As joists were laid, carpenters would have become involved- they made 50 cents per hour. It’s possible there were several classes of carpenters, much in the same way there are now: framers for the joists and studs, finish carpenters for moldings and trim, cabinetmakers for cabinets and fixtures. Or, it’s possible that a crew of versatile craftsmen were capable of fulfilling all of Frank Novak’s carpentry needs. After the bones of the house had been assembled, plasterers (60 cents per hour) would have entered the picture. The common laborers who helped all these tradesmen usually earned 33 cents per hour. 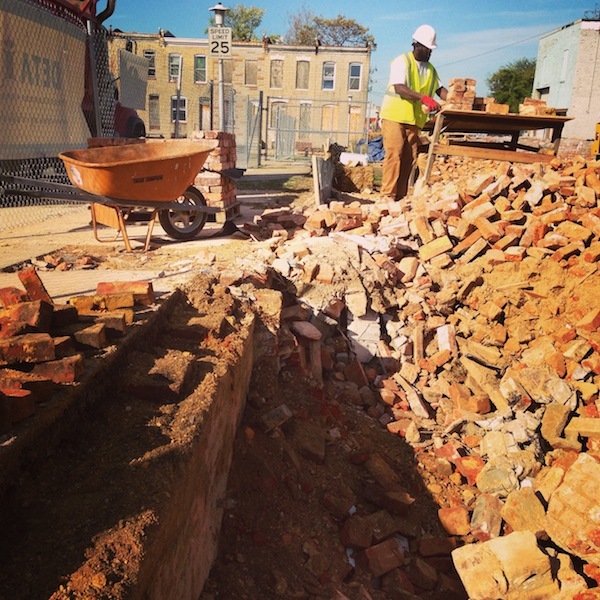 Missing from the above-mentioned tradesmen are dozens of specialized artisans and craftsmen who contributed to rowhouses across the city: lathers, tinners, plumbers, carters, glaziers, etc. Charles Belfoure and Mary Ellen Hayward gleaned the figures above from the records of Edward Gallagher, one of Frank Novak’s biggest competitors. Gallagher’s building costs amounted to roughly $1.18 per square foot. Novak claimed that his costs were 70 cents per square foot, so it’s safe to assume that he paid his workers significantly less than the rates above. So Who Built Our Houses? Throughout this blog, we’ve often said things like “the folks who built our houses” or “the builder decided to do XYZ”. We’ve been coy. It’s time to talk about Frank Novak, the man who built the 2300-2400 blocks of Eager Street. 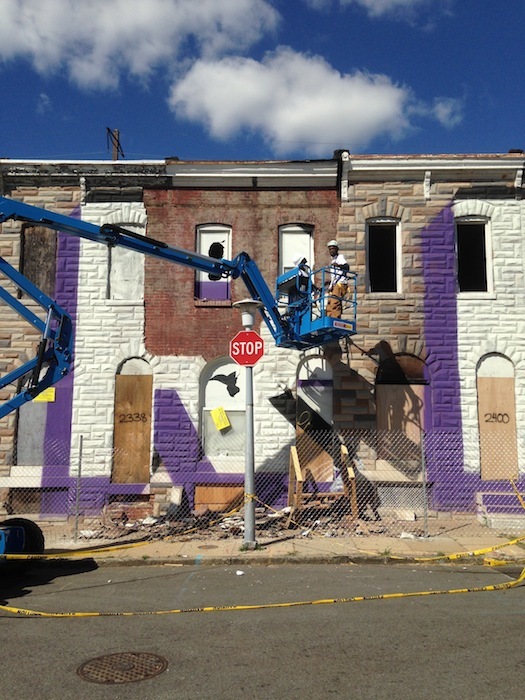 This post is largely indebted to Mary Ellen Hayward’s essential book, Baltimore Alley Houses. Frank Novak was born in Baltimore on March 17, 1877. The Novak family had come to America just two years before Frank’s birth, and had made a home at 420 N Castle Street after living briefly on N Chapel Street. By the time he was 13, young Frank was working as a carpenter’s apprentice. In 1899, Frank was a 22 year-old carpenter working under August Hanneman, a German builder. 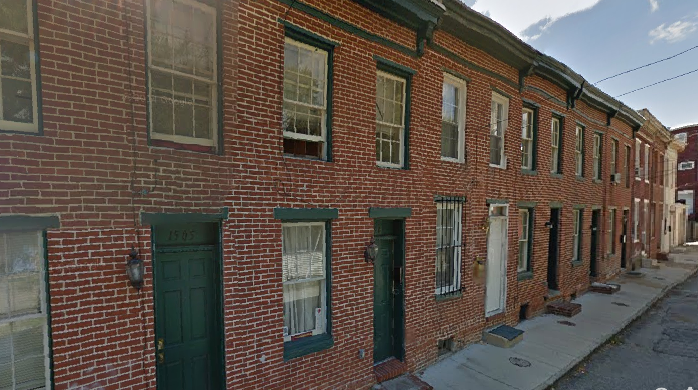 Hanneman and Novak had been building two-story houses along the 700 blocks of Patterson Park and Madeira Streets. Sadly, Hanneman died when the block was half-finished and Novak became thrust into the role of builder. 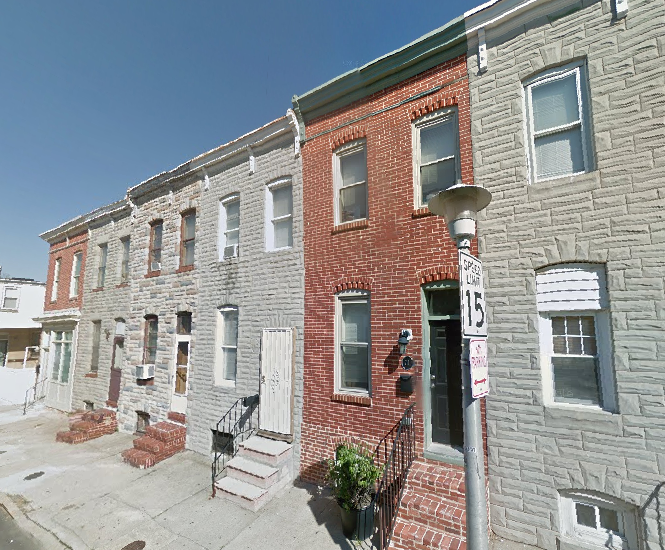 Novak wasted no time, buying the rest of the block from Hanneman’s widow and then buying 35 lots along Madison, Madeira and Collington Streets. 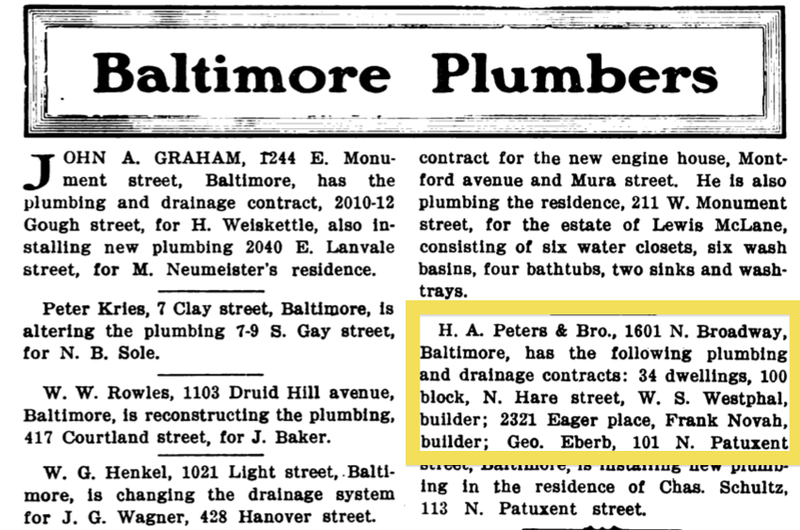 He sold his first house in July of 1900 and then moved on to the 800 blocks of North Patterson Park and Collington, eventually acquiring and building upon dozens of blocks to the north and to the east. 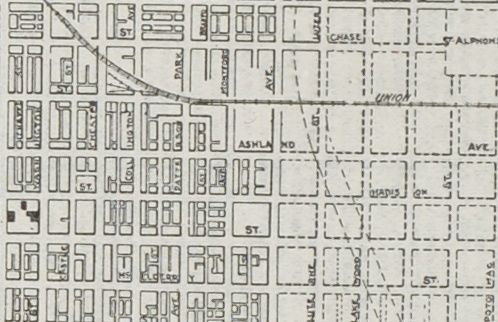 In 1904, Novak built 14 homes on Bradford for $10,000 total, or around $700/per. 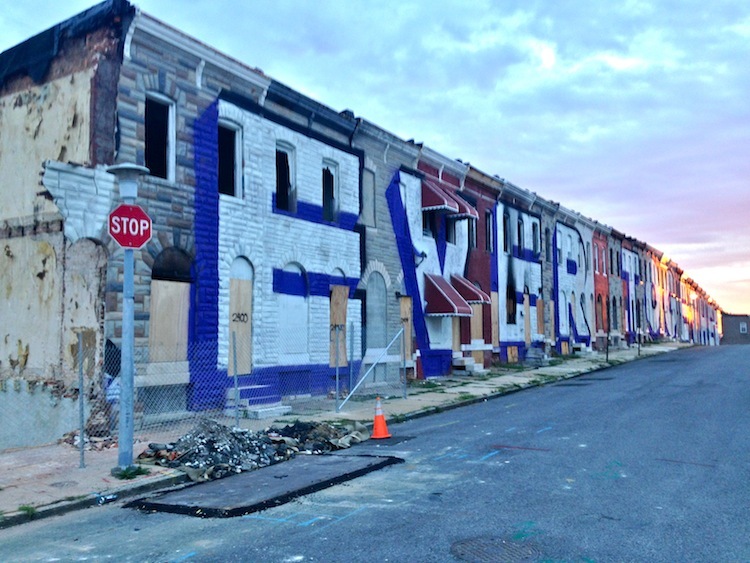 Three years later, he built 22 homes on Montford between Ashland and Eager for $20,000 total. You can see that Frank Novak (misspelled “Novah”) is listed as the builder of 2321 Eager Place. Based on the construction dates of the surrounding blocks, it seems likely that the beautiful block of homes you see below was built in late 1907 into 1908. 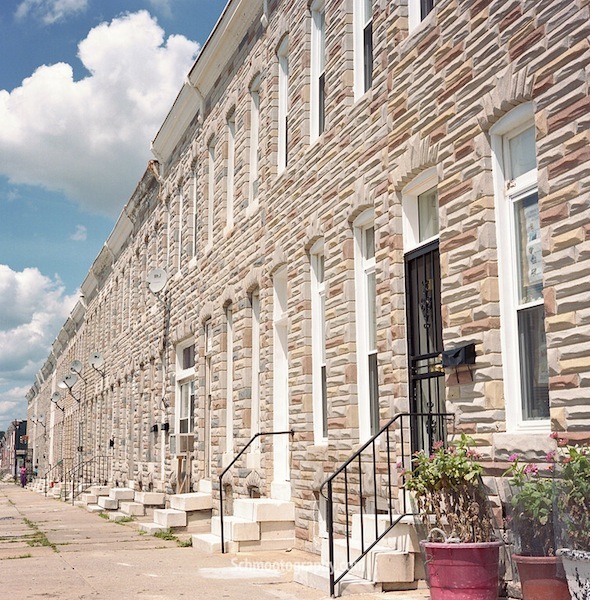 The houses on Eager Street were the nicest Novak had built to date and represent a maturation in style from the earlier houses he’d built, but are distinct from the houses he would become most famous for, the brown Roman-bricked rows you see below that fill entire neighborhoods of East Baltimore. 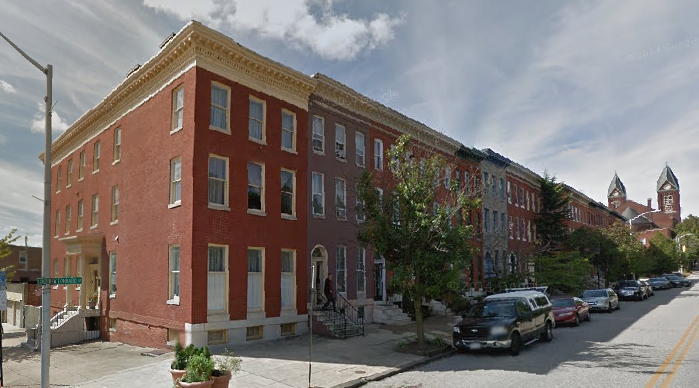 We’ll get into some more specifics about Novak’s building practice in a later post, but for now just know that Novak went on to become known as “The Two-Story King of East Baltimore,” with nearly 7,000 rowhouses attributed to him. A few weeks ago, we presented a brief course on the belt course, noting that the Cockeysville marble featured in the houses on Eager Street sets them apart from houses on neighboring blocks. 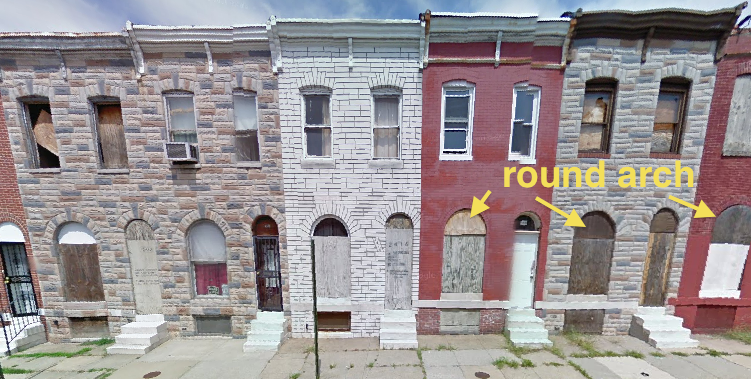 Today we’re going to look at another architectural feature that makes the 2400 block of Eager Street special: semi-circular round arched windows and doorways. Imposing three-bay wide, three-story houses with top-of-the-line materials and fashionable detailing lined main streets and parks (a la the 1500 block of W Lombard below) and were intended for wealthier folks. 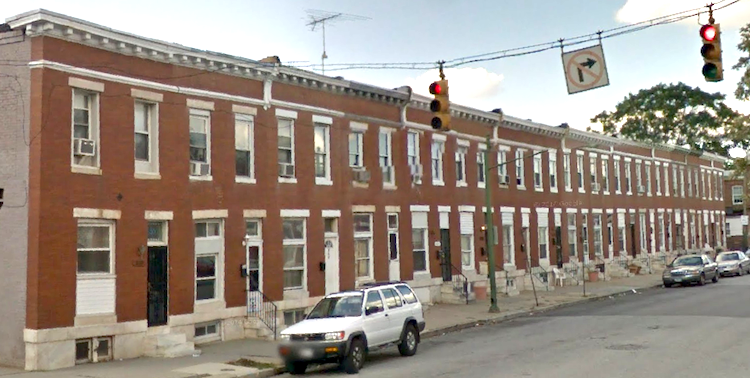 Smaller and less ornate three-story houses sat on parallel streets, like the 100 block of S Stricker seen below, and were targeted at folks with more modest incomes. 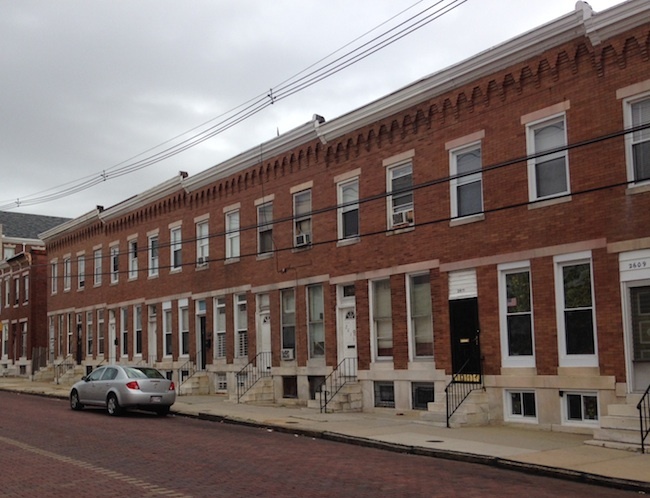 Comparing the photos above and below, you can see that the houses on Stricker are shallower, shorter and narrower, and lack the marble stoops and substantial cornices seen on the Lombard houses. Smaller two-story houses sat along the alleys that cut through blocks, like the 1500 block of Lemmon Street below. These homes were built as no-frills workforce housing. 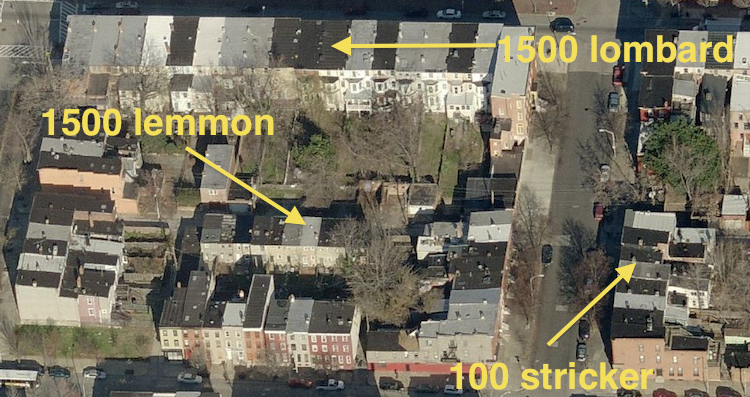 In West Baltimore, this rowhouse hierarchy can be pretty easy to spot. Out in our neck of the woods in the Milton-Montford neighborhood, the task is made a bit trickier because almost all of the houses are two-story and there was less of a wealth discrepancy among inhabitants than there was in the West Baltimore neighborhoods of the mid 19th century. Without the gimme three-story houses denoting the creme de la creme, one must look for other cues, which brings us back to those round arches on Eager Street. The 900 block of Bradford Street was built just before the 2400 block of Eager Street. On Bradford, you can see that the doors and windows feature flatter segmental arches with a curve that is only slightly pronounced. On Eager Street, the doors and windows feature the round half-circle arch you see below. This is not a jaw-dropping difference, but it is significant- along with the marble stoops and belt courses, these round arches signify that the houses on Eager featured higher quality materials and more advanced building techniques than their predecessors. While it’s not as obvious as the discrepancy between the three-story monsters on Lombard the humble two-story dwellings a hundred feet south on Lemmon, these subtle architectural differences likely corresponded to small differences in price and, perhaps, clientele. 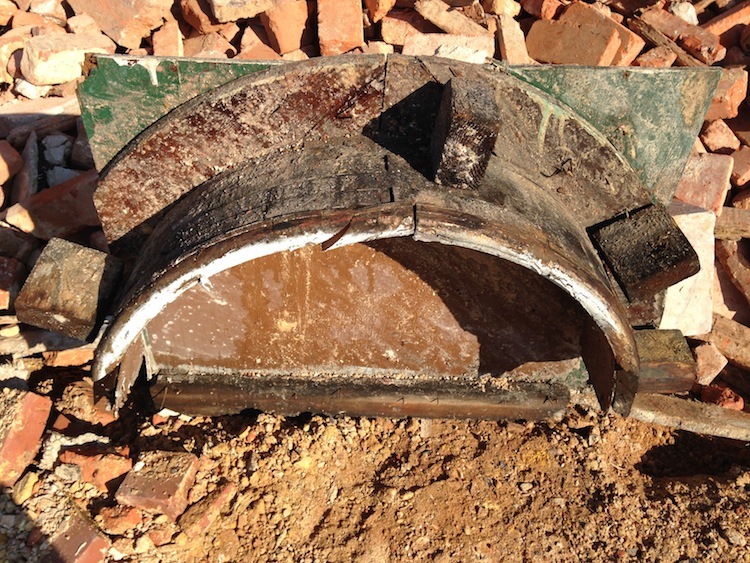 The round arched doorways were fitted with a wooden transom casing that tied into the brick. This casing was pieced together from a dozen or so curved pieces of wood. 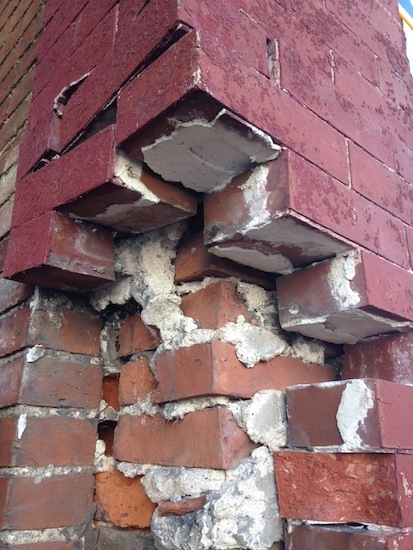 The craftsmanship involved in creating the casing (as opposed to a relatively simple flat lintel or unsupported segmental brick arch) suggests that extra costs may have been incurred during construction to add details that might have allowed for higher sales prices. In a future post, we’ll explore why it’s also likely that the semi-circular arches were the work of a builder growing ever more confident in his craft. So Whats the Big Deal About Longleaf? Way back in the way back, we talked about the tree species that collectively form the group known as Southern Yellow Pines. Remember? 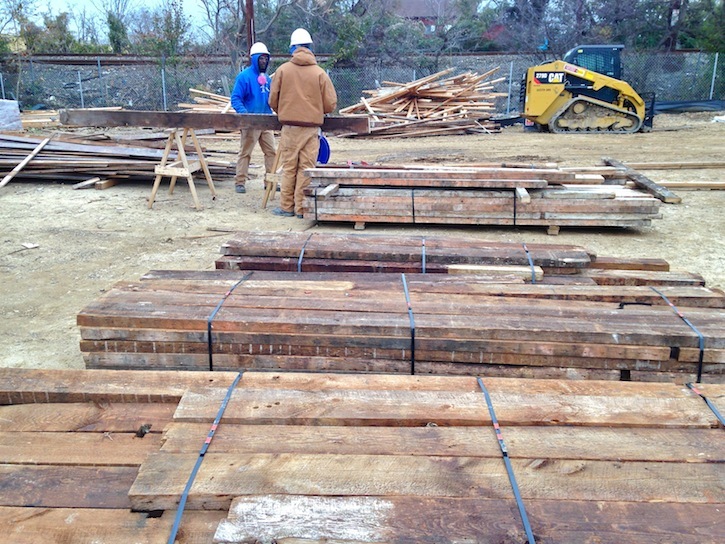 We talked about how most of our joists were various species of SYP: shortleaf, loblolly and slash pines. We did, however, leave one species out of our discussion of SYP, promising that we’d dedicate a separate post to it. 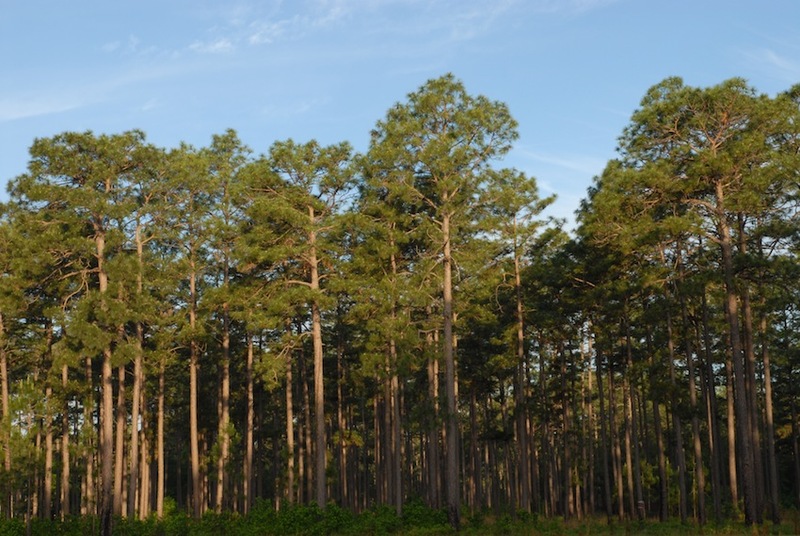 Two months later, we’re delivering: here is the post about Longleaf Pine. Longleaf Pine (Pinus palustris) is a tree among trees: virgin trees once grew to up to 150 ft tall with trunk diameters of nearly four feet. “Palustris” refers to swamps or marshes, and represents a significant taxonomic error made by esteemed Scottish botanist Philip Miller, who first “discovered” the species during winter flooding and mistakenly assumed a marshy habitat. 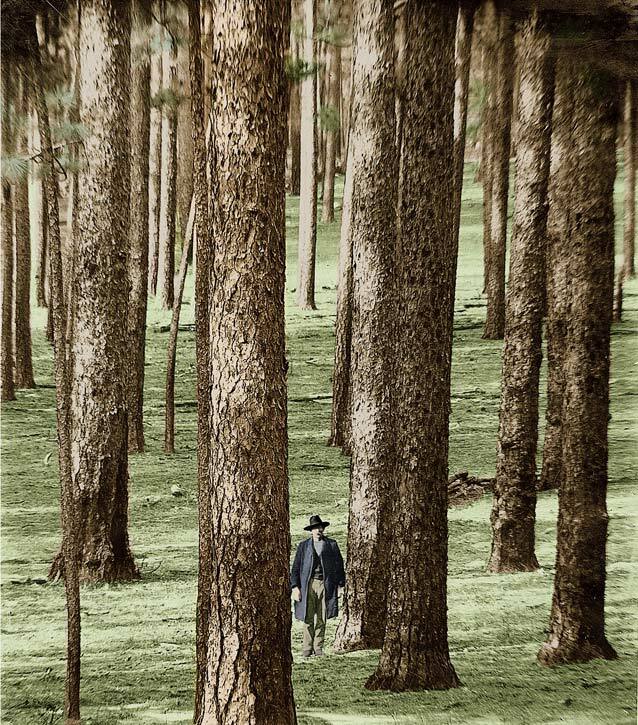 Longleaf forest once dominated the Southeastern region of the US, with an estimated 90,000,000 acres of tall, straight, sturdy trees creating a supply of lumber that was seen as essentially inexhaustible. Fast forward to the present, and only .01% of those old growth longleaf forests exist. In the reclaimed wood world, longleaf represents the gold standard of pines- because the tree grows slowly, it creates an extraordinarily tight grain with pronounced resin in latewood growth rings. High resin content, which made the tree especially useful as a source for pitch and turpentine, makes longleaf lumber wonderfully fragrant, and unusually heavy and hard. 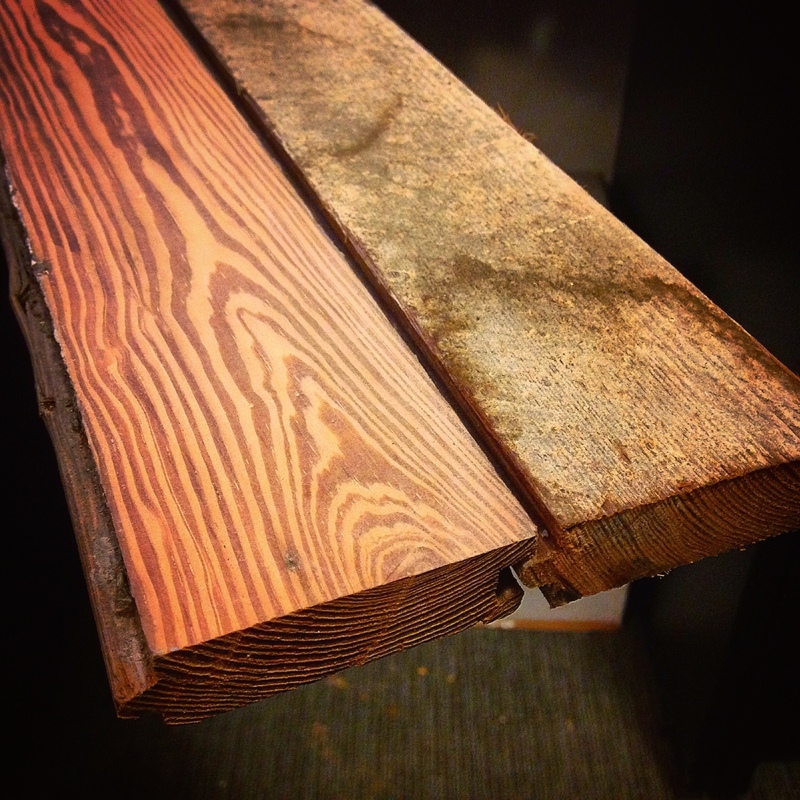 For a so-called softwood, longleaf lumber is just about as hard as some maple species. As a general (though not ironclad) rule, first floor flooring in older houses was milled from harder woods than second floor flooring- higher foot traffic meant that first floors featured oak, ash, maple, and other hardwoods while second floors usually got softwoods like pine and fir. Though hardwood species were predominately used in higher end houses, the rule of using harder wood on the first floor often applies in more modest old houses. On Eager Street, most of the first floors feature longleaf flooring, while the second floors are various softer SYP species. In 1907, when the floor was laid, longleaf pine was certainly a lower-cost alternative to hardwood, offering comparable hardness at a discounted price. One hundred odd years later, longleaf is a low-cost alternative no more, fetching a pretty penny as one of the more desirable reclaimed wood species. It’s not hard to see why: a quick pass through a planer knocked off 107 years of footfall and dust, resulting in the gorgeous board you see on the left.